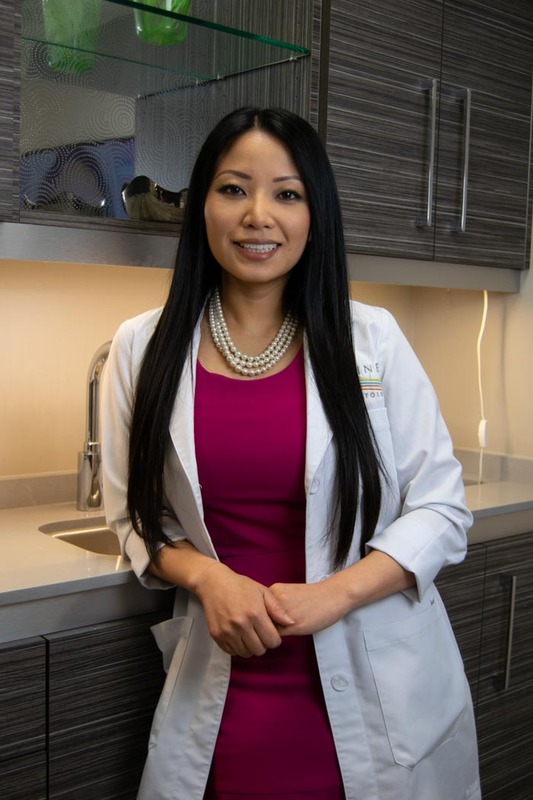 Jaeny Kim, FNP is a board-certified Family Nurse Practitioner (FNP), accredited by the American Academy of Nurse Practitioners, and proud to be practicing clinical dermatology alongside Dr. Steven Swengel, MD. She also loves long walks on the beach and binge-watching Netflix series for an added touch of complexion-inspiration (have you seen the skin on the celebrities these days? Jaeny has, and she’s all about giving that glow to patients). Get in touch with Jaeny at Refined Dermatology and find out more about getting that A-list look. Learn more about our dermatology practice and please contact Refined Dermatology today to schedule an appointment – 408-384-3845. Jaeny believes that optimal skin is possible with a customized skin care regimen and regular protection—in other words, if you aren’t a sunscreen addict already, she’ll convert you. She began her career as a Registered Nurse working in a variety of settings from Med-Surg to the ER and Plastic and Reconstructive Surgery. Jaeny has been awarded numerous accolades and has received recognition in patient care leadership. She doesn’t like to brag, but she also graduated with honors from Western University of Health Sciences, Pomona, where she completed her Masters and FNP residencies. As an adolescent, Jaeny battled severe acne throughout high school. Like many patients, she tried everything from toothpaste (hey, it sometimes works) to antibiotics and retinoids. Finally, she was prescribed isotretinoin, and it changed her life. One of her biggest regrets is not getting the prescription sooner, but too often young adults don’t immediately meet the best dermatologists. As an adult, Jaeny was diagnosed with Celiac disease, and also suffers from a rare form of herpetic dermatitis which affects less than two percent of the Celiac population. Even a tiny bit of gluten in her diet can cause immediate itching, irritation, and plenty of embarrassment. Don’t feel bad for Jaeny, though. She knows all the secrets to making a drool-worthy gluten-free pizza. She truly understands what so many of her patients suffer with, including the shame and frustration that often accompanies acne and dermatitis. Been there, done that? Jaeny has, and patients love having a provider who really gets them—and their problem skin. Jaeny is an active member of the American Association of Nurse Practitioners and Dermatology Nurse’s Association. She’s received specialized training in dermatology and is able to provide a full scope of dermatological services. She can diagnose, treat, and prescribe for all skin conditions so patients really get it all in one seriously compassionate provider. Highly skilled in performing full body exams, biopsies, sutures, cosmetic procedures, and more, you’re literally in good hands with this former acne sufferer. From Botox to laser hair removal, Q-switch laser to dermal fillers, there’s nothing Jaeny hasn’t perfected. She loves connecting with patients, and considers those relationships the most educational and rewarding aspect of her career. When she isn’t taking down acne and making skin flawless, she enjoys traveling, gardening, golfing, and spending time with her family (that would be her real Tinder bio if she were on the app—though she admits walks on the beaches are fabulous, albeit cliched). Contact Refined Dermatology today by calling 408-384-3845 and schedule an appointment with Jaeny today.